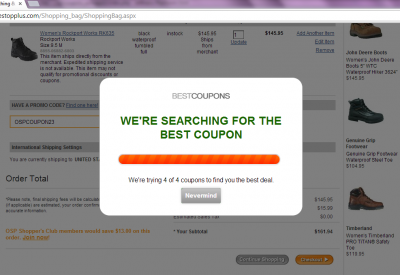 The customary coupon browser add-on typically notifies consumers about any and all available coupon codes for the site they are browsing. This places the burden of action on the consumer to browse through the available offers and choose the best coupon from those presented. In some cases, the shopper will be offered more than a dozen available coupons before being prompted to make their selection. 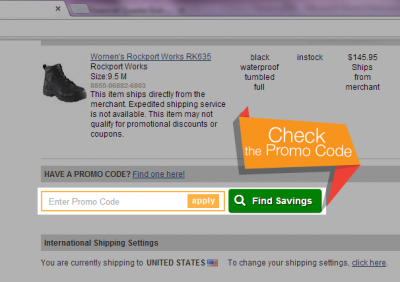 Add-on adds a button on the checkout page, next to the field where promo codes should be entered. The user just needs to click that button, and add-on will do the rest. While the user is resting, add-on applies all the available coupons one by one, to determine which one gives the highest discount. 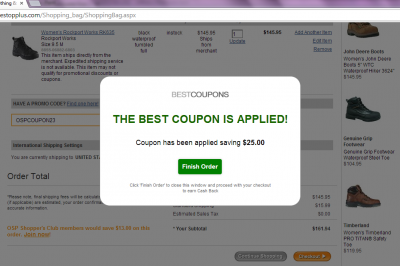 When best coupons found, add-on applies it, and tells user how much he/she will save with this coupon. The user just needs to click “finish”, and may proceed with checkout.